Gong are a progressive rock band formed by Australian musician Daevid Allen. Their music has also been described as space rock. 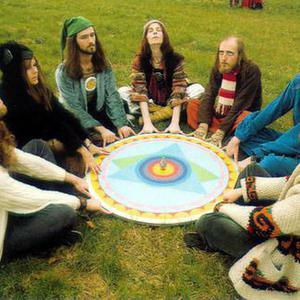 The various incarnations of Gong, its spin-offs and related bands are collectively dubbed the "Gong Global Family". They were formed in 1967, after Allen - then a member of Soft Machine - was denied entry to the United Kingdom due to a visa complication. Allen remained in France where he and a London-born Sorbonne professor, Gilli Smyth, established the first incarnation of Gong. They were formed in 1967, after Allen - then a member of Soft Machine - was denied entry to the United Kingdom due to a visa complication. Allen remained in France where he and a London-born Sorbonne professor, Gilli Smyth, established the first incarnation of Gong. This band fragmented during the 1968 student revolution, with Allen and Smyth forced to flee France for Deya in Majorca. They found a saxophonist, Didier Malherbe living in a cave in Deya, before film director Jerome La Perrousaz invited the band back to France to record the soundtracks to his movies. They were subsequently approached by the newly formed independent label BYG and signed up for two albums (Magick Brother/Mystic Sister, Camembert Electrique and Allen's solo album Bananamoon. Gong played at the first Glastonbury Festival and were subsequently one of the first acts to sign to Virgin Records, getting first pick of the studio-time ahead of Mike Oldfield. By 1971, a regular line-up had established itself, and Gong released their Camembert Electrique album. The UK release, put out by Virgin Records subsidiary Caroline Records in 1974, was priced at 49p (i.e. the price of a typical single rather than an album), ensuring that sufficient numbers were sold for the album to chart (had it not been barred from the charts for being so cheap). Between 1973 and 1974 Gong, now augmented by bass player Mike Howlett and guitarist Steve Hillage, released their Radio Gnome Trilogy ? three records that expounded upon the (previously only hinted at) Gong mythology ? starting with Flying Teapot and Angel's Egg both released in 1973, and You in 1974. At a gig in Cheltenham, in 1975, Allen refused to go on stage, claiming that a "wall of force" was preventing him. He left the band, as did Smyth, who wanted to spend more time with her two children. The band also lost keyboard player Tim Blake, replaced by Patrice Lemoine. The band continued under the control of drummer Pierre Moerlen in order to fulfil contractual obligations, touring the UK in November 1975 (as documented on the 2005 release Live in Sherwood Forest '75) and working on their next album Shamal, but Hillage and Miquette Giraudy left before Shamal was released in 1976. (They re-joined the band briefly for a 1977 live reunion.) Gong morphed into a jazz rock outfit, renamed Pierre Moerlen's Gong after the departure of Didier Malherbe in 1976. This group reformed without Moerlen in the early 1990s as Gongzilla. The Gong mythology, however, continued from the late seventies up until the nineties in Allen's solo work, and with bands such as Euterpe and Planet Gong (a collaboration with Here & Now), while Smyth formed a separate band, Mother Gong. In 1992, Allen and Malherbe reformed Gong and released the album Shapeshifter, subsequently dubbed "Radio Gnome, Part 4". In 2000, a 5th installment: Zero to Infinity was released, featuring Smyth, and classic line-up bassist Mike Howlett. However 2004 saw a radical new Gong line-up including current member Kawabata Makoto and former member Cotton Casino from Acid Mothers Temple. Allen and Smyth's son Orlando Allen joined on drums for the album Acid Motherhood.